World Australian Cattle Survived Years of Drought. Then Came the Deadly Rains. Australian Cattle Survived Years of Drought. Then Came the Deadly Rains. What began as welcomed rain after several years of crippling drought in Australia turned into a catastrophe after record-breaking downpour flooded the northeastern coast, killing hundreds of thousands of cattle, wiping away the livelihood of many farming communities and threatening one of the country’s vital industries. Nearly 50 million acres of land in the state of Queensland was inundated this past week. By late last week, officials said two years worth of rain had drowned swaths of land that, not too long ago, were parched. Parts of Queensland, particularly the coastal areas, saw more than 11 inches of rain last week. Officials estimate that more than 300,000 herd cattle were killed, though that number could rise. One producer who normally has about 70,000 cattle has found only 1,000 as of last week, officials said. Countless carcasses, many huddled together in mud, have been discovered as water began to recede. 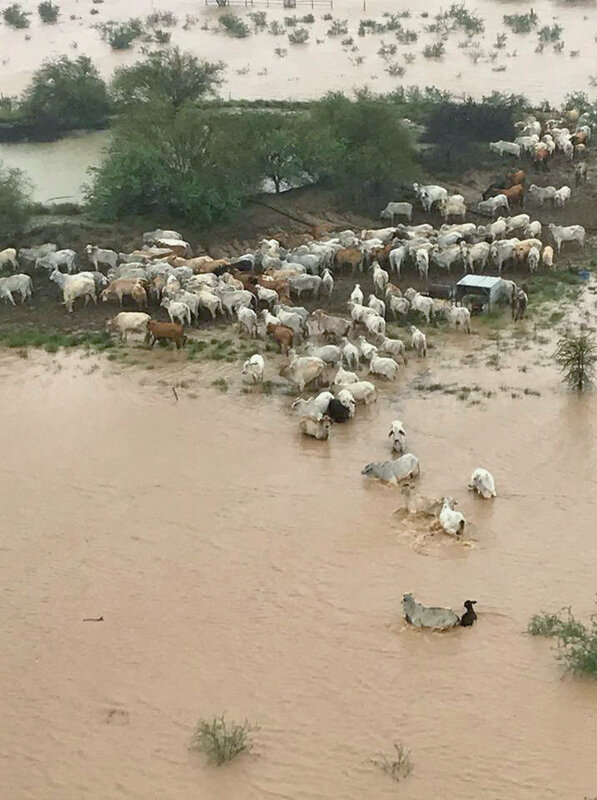 Officials “were literally ferrying one barrel of hay at a time” to feed surviving cattle that have been isolated by floodwater, Georgie Somerset, general president of Agforce Queensland, which represents farmers, said at a news conference. “The speed and intensity of the unfolding tragedy makes it hard to believe that it’s just a week since farmers’ elation at receiving the first decent rains in five years turned to horror at the devastating and unprecedented flood that quickly followed,” Michael Guerin, AgForce Queensland’s chief executive, said in a statement Monday. Many farmers, Guerin said, have not only lost their livelihood, but are also left with crippling debt. “What I’m concerned about now is the next two to five years and how we support these people to actually get back on their feet to restock their companies, to rebuild their infrastructure to rebuild fences … and get their businesses back and running,” Somerset said. Australia’s economy relies heavily on its cattle herds, the majority of which are raised in Queensland. It was the world’s third largest beef and veal exporter in 2017. That fiscal year, the country exported about 1 million tons of beef and veal to 78 countries, including Japan, the United States, South Korea, China and Indonesia. The Queensland government has given more than $100 million in aid, in addition to $3 million in mental-health services for flood victims. In flood-stricken Townsville in northern Queensland, floodwaters have heightened risks for illnesses. One woman has died of a rare bacterial infection called melioidosis, which is caused by bacteria commonly found in soil, the Sydney Morning Herald reported. There have been nine other cases of melioidosis since the flooding. In a news release Wednesday, Queensland government officials said the disaster has affected 30 localities across the region and vowed to help with recovery. Australia has been at the epicenter of weather extremes, having recently endured its hottest January in recorded history. The continent’s climate has warmed by about 2 degrees since 1910, leading to more frequent heat waves and severe drought conditions, according to the Bureau of Meteorology. Eight of Australia’s top-10 warmest years on record have come in the past 13 years. Last month, a multiweek heat wave parched the landscape in South Australia, triggered damaging wildfires and toppled significant records. Temperatures soared to 116 degrees in Adelaide, South Australia. In the southeastern corner of the country, overnight temperatures were as high as 96 degrees at one point last month — the warmest overnight lows for January anywhere in the world. Near Santa Teresa in the Northern Territory, more than 50 wild horses dying of starvation and dehydration were euthanized. By early February, monsoon rains have caused record-level flooding in the northeastern part of the country.